Our multi-year ecosySTEM™ programs follow a sequential instructional format that includes field trips, school outreach programs, and an overnight component to meet the curriculum needs of school teacher, administrators and students. Our multi-year EcosySTEM™ programs follow a sequential instructional format that includes field trips, school outreach programs, and an overnight component to meet the curriculum needs of school teachers, administrators, and students. Students engage in a spiraling curriculum for the duration of their elementary career, beginning as early as Kindergarten. The EcosySTEM experience culminates in an overnight stay at our campus. 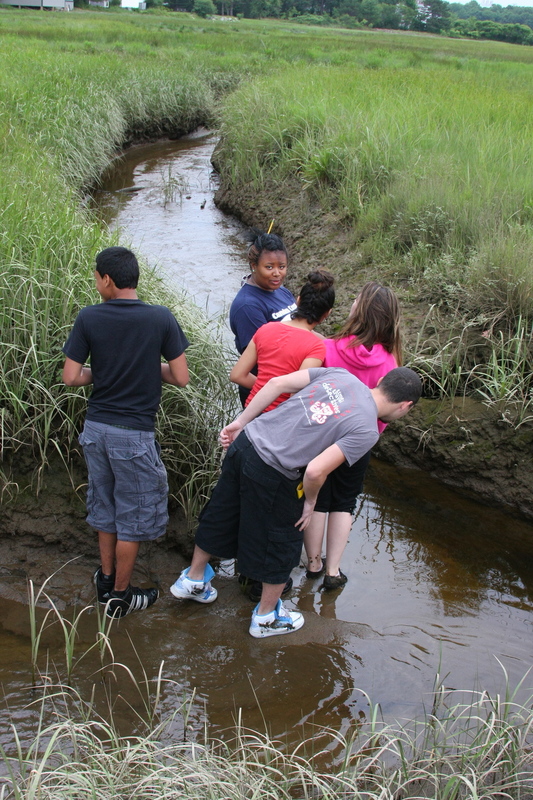 EcosySTEM programs use ecology as an integrating context for ESTEM instruction (Environment, Science, Technology, Engineering and Math), in particular utilizing the outdoor learning environment as a venue for applying ESTEM skills – hands-on activities and lessons that utilize content knowledge and skills application through authentic field experiences. Today’s 21st Century students require these skills, oftentimes as graduation requirements – skills ranging from the collection of data to the use of measurement tools to using the process of inquiry to ask questions and design solutions. EcosySTEM is an inquiry based learning model providing meaningful opportunities to learn, explore, apply, and assess. Our EcosySTEM programs are delivered in a sequential format to K-12 students. This delivery method provides a spiraling approach to acquisition of science skills and content, and supports a Proficiency Based Learning model (also known as performance-based, or standards-based learning). Proficiency based learning is predicated on students being able to demonstrate what they have learned, whether through performance based assessments (e.g project portfolios) or other embedded assessments. These types of skills are considered essential for success in school, college, professional careers, and adult life, and are the foundation of our teaching methodology. Throughout Ecology School EcosySTEM programs, students are provided with endless opportunities to explore the natural environment, learn ecological content, engage in data collection, use scientific tools, integrate math and literacy skills, and apply all of the above in an authentic learning context. Our multi-year program format is our most comprehensive curriculum delivery system, and our most successful. Please refer to our Research page for more information about our longitudinal Impact Study, designed to measure the effectiveness of EcosySTEM and our multi-year model. For more information about our Multi-Year model, please contact Director of Education & Curriculum Design Meg Edstrom Jones at MegATtheEcologySchoolDOTorg.